Saturn’s frigid moon Titan has a curious atmosphere. 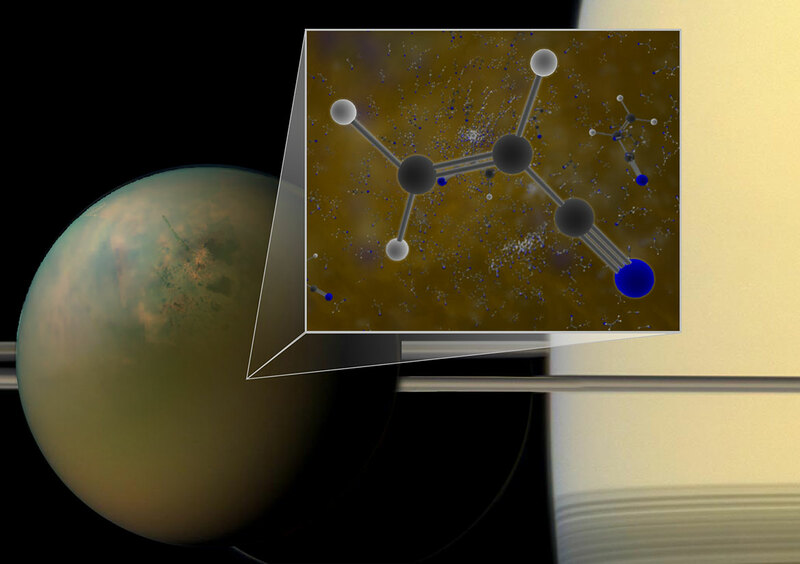 In addition to a hazy mixture of nitrogen and hydrocarbons like methane and ethane, Titan’s atmosphere also contains an array of more complex organic molecules, including vinyl cyanide, which astronomers recently uncovered in archival ALMA data. Under the right conditions, like those found on the surface of Titan, vinyl cyanide may naturally coalesce into microscopic spheres resembling cell membranes. Saturn’s largest moon, Titan, is one of our solar system’s most intriguing and Earth-like bodies. It is nearly as large as Mars and has a hazy atmosphere made up mostly of nitrogen with a smattering of organic, carbon-based molecules, including methane (CH4) and ethane (C2H6). Planetary scientists theorize that this chemical make-up is similar to Earth’s primordial atmosphere. Archival ALMA data have confirmed that molecules of vinyl cyanide reside in the atmosphere of Titan, Saturn’s largest moon. Titan is shown in an optical (atmosphere) infrared (surface) composite from NASA’s Cassini spacecraft. 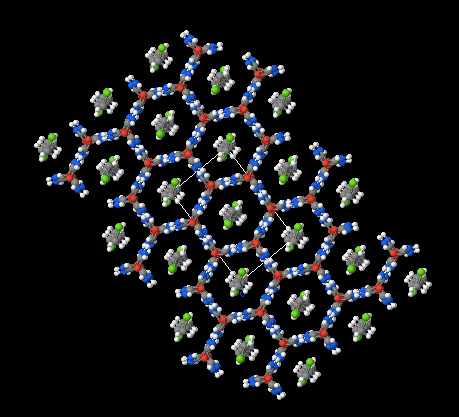 In a liquid methane environment, vinyl cyanide may form membranes. Credit: B. Saxton (NRAO/AUI/NSF); NASA. These results are in a paper titled ALMA Detection and Astrobiological Potential of Vinyl Cyanide on Titan, M. Palmer et al., appearing in Science Advances [see above]. Titan, Saturn’s largest moon, is the only solar system object other than the Earth to have a thick atmosphere and standing surface liquid. 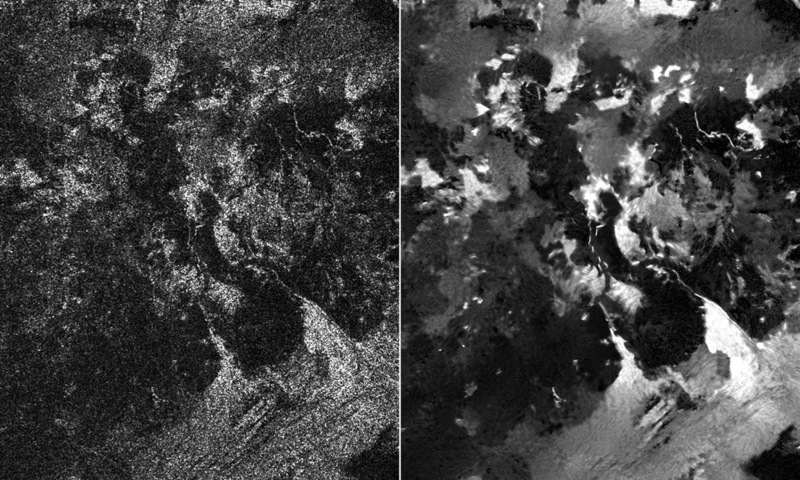 When the Cassini spacecraft began observing Titan, it even discovered lakes and seas dotting the northern hemisphere. Don’t fire up your rocket just yet, though—because Titan is so cold, the lakes and seas are filled with liquid methane and ethane rather than water. Titan’s thick, methane-rich atmosphere makes it difficult to observe the surface at visible wavelengths. Luckily, there are several windows in the near-infrared through which light can pass and reveal the surface. Seven of these windows overlap with the wavelength range covered by Cassini’s Visual and Infrared Mapping Spectrometer (VIMS). By looking at how the brightness of the surface changes with wavelength, we can learn about the composition of the surface material. 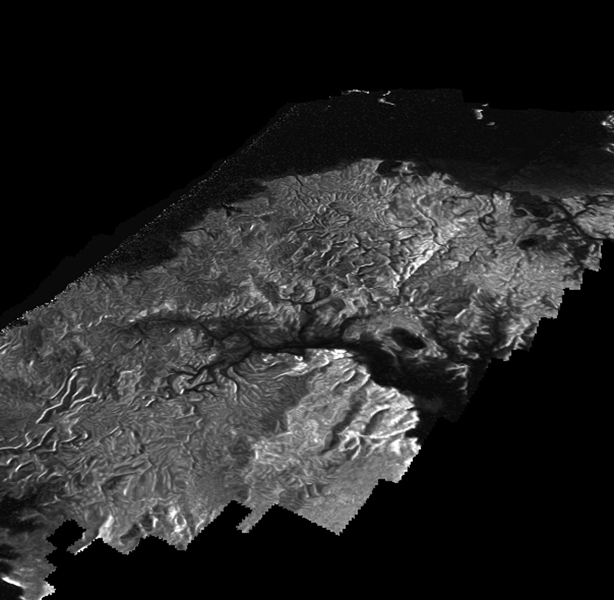 Figure 1 depicts a three-color map of Titan’s surface made with VIMS. The pinkish regions show where the surface reflects strongly at 5 microns. Figure 1. 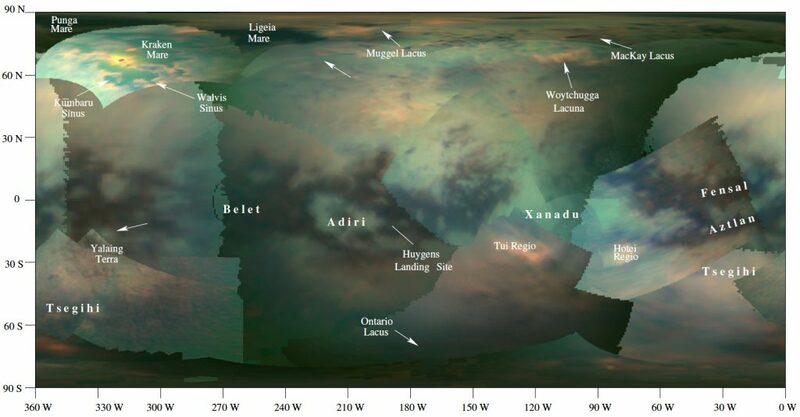 Map of Titan’s surface from Cassini. Red is 5 microns, green is 2 microns, and blue is 1.3 microns. Many of the major geographic regions are labeled. Some of the regions selected for this study are indicated with the white arrows. The 5-micron-bright regions are found circling lakes in the northern hemisphere, in dry lake beds in both hemispheres, and in the desert-like equatorial regions. The bright rings around the lakes are believed to be evaporites—solid material left behind after the liquid it was dissolved in evaporates. This explains the presence of the bright material surrounding the lakes and the dry lake beds, but what about the desert? Linking 5-micron-bright regions in what is today a desert to the bright rings around the lakes could provide evidence that the equatorial regions of Titan were once covered with liquid. In this paper, the authors searched for a compositional link between the bright regions in the desert and the evaporites around the lakes and seas. They used an absorption feature at 4.92 microns in order to investigate whether or not the 5-micron-bright material in each of these regions is the same. The 4.92-micron absorption feature has been observed previously in the desert region, but no one has been able to definitively say what compound causes it. Because of this, finding the same feature in the desert and around the lakes can indicate that the regions are geologically similar, but can’t yet tell us about the chemical makeup of the material. The authors used Principal Component Analysis (PCA) to isolate the weak 4.92-micron absorption feature. PCA is a mathematical method that separates the individual components that make up an observed signal. In this case, the main contributors to the signal (i.e. the “principal components”) could be changes in the surface reflectivity, instrumental noise, or compositional variations. Once the components have been separated, the unwanted contributors can be removed. As a result, PCA can be used to isolate a signal that is much smaller than the background noise. (PCA is also used in the direct detection of exoplanets and is described in more detail here.) After applying PCA, the authors observed the 4.92-micron absorption feature in both the desert and around the lakes, strengthening the hypothesis that the desert once had liquid. However, they also found that not all of the lake regions had the absorption feature, and some of the regions that did have it didn’t have it in every observation. They suggested that material with a crystalline structure that reflects light more strongly at some angles or transient effects like methane rain could cause the absorption feature to appear intermittently. What causes some lake regions to have the absorption feature while others don’t? The authors suggested that the material that causes the 4.92-micron absorption feature could be just one of several solids that are left behind as the lakes evaporate away. Whether or not a lake rim has the absorption feature could be a function of how far the evaporation has progressed. As evaporation proceeds, materials that are more soluble precipitate out in sequence. We could see a 5-micron-bright evaporite ring without the absorption feature if the lake hasn’t evaporated enough for the material causing the absorption to precipitate out. The authors even have a suggestion for why this might happen to some lakes in the northern hemisphere but not others—lakes closest to the north pole might experience more methane rainfall than more southern lagoons, periodically halting the evaporation before the absorbing material can crystallize. Although the authors posit many explanations for the mysterious behavior of the 4.92-micron absorption feature, they can’t yet settle on one cause. It’s not surprising that Titan, an inhospitable but strangely familiar world with complex geology and weather systems, presents a challenge to astronomers. In the future, by modeling how Titan’s climate changes over time, we can hope to learn more about what causes the distribution of evaporites on Titan’s surface. A recent study led by Olivier Mousis, a Cassini research associate at the University of Franche-Comté, France, examined how Titan’s methane rainfall would interact with icy materials within underground reservoirs. They found that the formation of materials called Clathrate changes the chemical composition of the rainfall runoff that charges these hydrocarbon “aquifers.” This process leads to the formation of reservoirs of propane and ethane that may feed into some rivers and lakes. The results are published in the Sept. 1, 2014, printed issue of the journal Icarus. The research was funded by the French Centre National d’Etudes Spatiales (CNES) and NASA.